NAMM 2011 PRESS RELEASE: JBL Professional and UK/ROI distributor Sound Technology Ltd are pleased to introduce, and announce immediate availability of, the new EON515XT active loudspeaker. As the flagship of the iconic JBL-powered portable speaker collection, the EON515XT has been engineered for durability, high performance and ease of use. JBL has extended the reach of the current EON technology by improving input sensitivity, lowering the noise floor, adding user selectable EQ control and re-voicing the system for peak performance and enhanced audio precision. 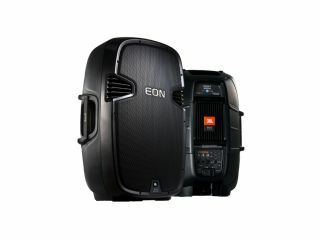 "In the development of our PRX600 Series we've learned and implemented quite a few things that enhanced system performance," said Richard Ruse, JBL Director of Marketing for Portable PA. "We knew we could do the same for the EON515XT and quite frankly, we couldn't wait to do it. Through amplifier optimization and restructuring of the gain stages, we've increased the maximum SPL from 129 dB to 132 dB. We've made the system quieter when idling and re-voiced the system for a more even spectral balance. I think it's the most musical EON we have ever built." The 2-way EON515XT incorporates a JBL 2414H high-frequency neodymium compression driver and a 15-inch JBL 265F-1 Differential Drive® dual-voice-coil woofer perfectly matched to a proprietary Crown® Class D amplifier. The system has been re-voiced from previous models for better clarity and frequency balance and now delivers a stout 132dB maximum SPL. The input sensitivity has been increased by 10dB to accommodate keyboards, musical instruments, drum machines and lower output sound reinforcement and DJ mixers. The EON15XT now offers user-adjustable EQ with individual bass and treble controls and a simplified 3-channel mixer configuration—an especially beneficial live performance feature that allows users to plug in multiple instruments and microphones. Built to take the rigours of the road, the JBL EON515XT has been restyled for discretion with a tough, moulded black enclosure, black metal grille, black JBL badge, and charcoal EON grille logo. The EON515XT can be pole-mounted on a subwoofer or tripod stand using its 36 mm pole-mount socket, used in a floor monitor position or flown using its integrated M10 suspension points. It offers two 1/4-inch TRS inputs, one combination XLR/TRS input and an XLR loop-through output for connecting another EON speaker, recording device or for routing to an external devices. Weighing just 32.5 pounds, the EON515XT features multiple grip points designed for comfort, safety and balance. The JBL EON 515XT is available now priced at £685 RRP ex VAT.